The National Federation of the Blind of California knows that blindness is not the characteristic that defines you or your future. Every day we raise the expectations of blind people because low expectations create obstacles between blind people and our dreams. You can live the life you want; blindness does not hold us back. Together with love, hope and determination, we transform dreams into reality. Since 1971, the National Federation of the Blind of California has been helping members live the lives they want! With our chapters, divisions, committees, programs, and projects, the National Federation of the Blind of California is making the public aware that the real problem concerning blindness is not blindness itself but the lack of knowledge, understanding, and opportunity from our sighted peers. Get involved in the largest organization of the blind in the nation and in the state. Get involved in the National Federation of the Blind of California and help us live the lives we want. Find out about our National Convention in Las Vegas, Nevada from July 7-12, 2019! NFB-NEWSLINE® is a free service offering access to newspapers available to anyone who is blind, vision impaired or print-disabled. It offers over 500 publications to choose from, including 12 national newspapers like the Wall Street Journal and USA Today, 20 breaking news sources such as CNN, BBC and ESPN Online, 17 international newspapers including Financial Times and Vancouver Sun, and countless state newspapers, as well as over 50 magazines like Family Circle, Time, Smithsonian and more. For additional information, please visit www.nfbcal.org/nfb-newsline. 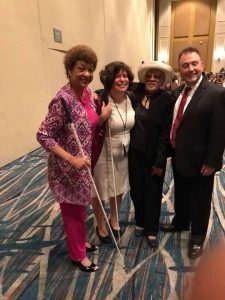 You can also contact the NFB-NEWSLINE coordinator for California, Robert Stigile, at 818-381-9568 or rstigile@gmail.com or contacting NFB-NEWSLINE at the National Federation of the Blind by dialing 1-866-504-7300 (toll free). Please read the KNFB Reader blog post found on the Blind With Vision Blog on the website of Mackey Enterprises LLC. The name of the blog post is “Blind People Reading Print They Can’t See? There’s an App for That!” You can read it at www.mackeyenterprisesllc.com/bwv-blog/blind-people-reading-print-they-cant-see. Visit sprint.com/vision</a or a Sprint store to purchase a new line of service or eligible upgrade. If you have any questions, please contact the NFB Vehicle Donations coordinator Pattie Chang at 410-659-9314 x2422 or pchang@nfb.org. Your Old Car Keys Can Be Keys To Literacy For The Blind. Donate your unwanted vehicle to us by clicking www.carshelpingtheblind.org or call 855-659-9314.